Card games are fun for the whole family. 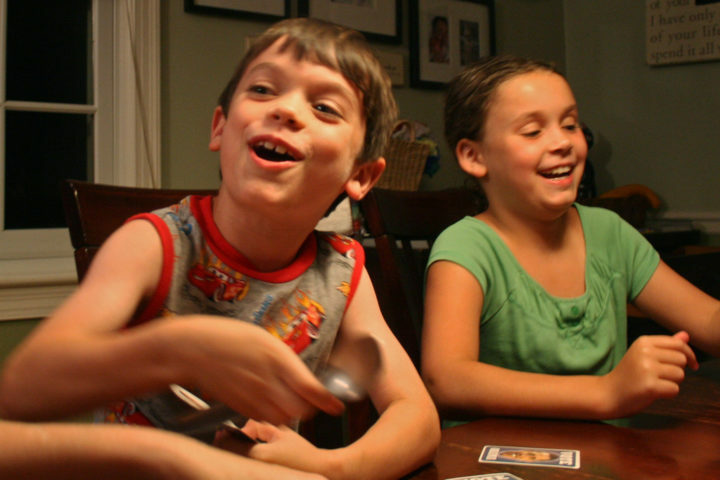 But when it comes to kids card games, don’t think you’re limited to playing time-tested classics like Uno or Go Fish. There are dozens of new, innovative card games for kids that you should be playing. Spot It! is an award-winning visual perception game for the whole family. I bought it as a Christmas gift for my niece this year. The game comes in a durable tin containing 55 cards and illustrated rules. Between 2 and 8 players can race each other to spot matching symbols. The game starts when 2 cards are laid face up on the floor. Between any 2 cards, there is always one and only one matching symbol. The player who spots the matching symbol first has to shout it out and gets to keep the card. At the end of the game, the player with the most cards is declared the winner. 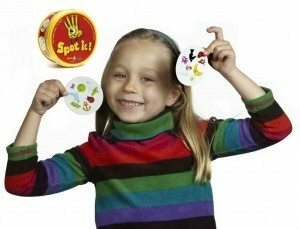 My $.02: There are actually 5 ways to play this game and it is enjoyable for adults and very young kids alike. The game develops focus and visual perception skills while helping to improve the verbal reasoning skills of young players. For instance, there will be plenty of arguing and debating when players disagree as the symbols on the cards may be similar, yet not identical. Younger kids will see this as a step up from playing the Concentration game. There are lots of fun variations to this game… Spot It! games for various ages and themes. This is one game I wish I’d discovered before my niece grew up and advanced to more mature kids card games. The Cat in the Hat playing card set contains 45 cards, one foam fishbowl, and one rules card. The red cards give a movement, the blue cards give a goal, and the yellow cards tell the player how to hold the foam fish. With the cards laid out face down, players take turns flipping over 3 cards at a time. If a player picks up one card of each color, they can attempt the activity. If not, play passes to the next player. For example, if a player turns over a red card with the movement ‘Roll’, a blue card with the goal ‘to the window,’ and a yellow card instructing them to keep the fish ‘on your head’… they have to roll to the window with the fish on their head. The prize for completing the challenge is getting to keep the cards. The player with the most cards at the end wins the game. My $.02: I call this game Cranium for Little Kids. It’s similar in that there are a variety of “tasks” to perform while playing this game. It helps kids discover their abilities and develops their self-confidence. It promotes reading skills for young players, while encouraging physical activity at the same time. Kids will have just as much fun watching daddy hop to the door and back as they will doing the actions themselves. Expect to have lots of fun, but be ready to swap cards if players draw challenging combinations! 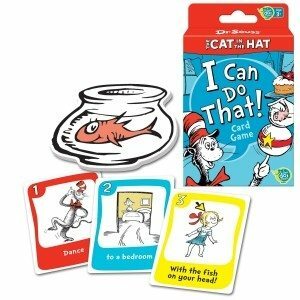 If your child enjoys Dr. Seuss, there are a number of other fun Cat in the Hat games for kids as well. The aim of Swap! is to get rid of all your cards. It’s not as easy as it sounds because your hand of cards is never really yours to keep. Of the 108 cards, most of the cards are bright red, blue, green, or purple. Players sit in a circle and take turns placing cards down if they have a card of the same color as the top card. Some of the cards are ‘Switch’ cards — meaning that player can change the color. Other cards are ‘Slap’ — requiring all players to slap their hands down on top of the center stack of cards. The last player to slap must take the entire stack! 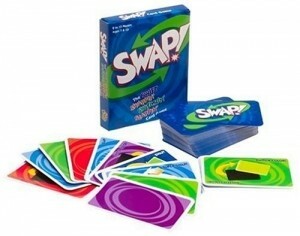 The ‘Swap’ cards take this game to a whole other level — a player can lay a ‘Swap’ card on top of the center pile and then chose another player with whom to swap. You might be down to your last 2 cards when another player decides to swap their hand of cards with yours! The final surprise is the ‘Super Swap’ card — where every player has to swap their cards with the person next to them. My $.02: There’s no slacking off with this game. One moment’s hesitation and you can find yourself with the entire pile of cards! Likewise, you can be foiled in your bid to win by an eagle-eyed player touting a ‘Swap’ card. Although this game is recommended for kids age 7 and up, much younger players still enjoy switching, swapping and slapping cards with others. As you can see, you definitely can’t go wrong with any of these 3 card games for kids. Whichever one you choose, there’s a world of fun to be had with kids of all ages!